Viewing only Posts from the Merchandise Category. After a whirlwind 3 and a half years of sell out shows Simon & I are pleased to announce that from FRIDAY 1ST APRIL – and the first Friday of every month – YOU DIG? will be moving to it’s new home of THE DEAF INSTITUTE, MANCHESTER. Playing in the main music hall, YOU DIG? will be bringing it’s infectious selections of Disco, Funk & Soul to one of the best venues in the UK. We are very excited to announce our next YOU DIG? BASEMENT TAKE OVER is on SATURDAY 28TH NOVEMBER @ SOUP KITCHEN, MANCHESTER. DJs on rotation include the legendary SIMON HAM & the rather less than legendary DIESLER. Doors OPEN from 11PM where it will be £4 BEFORE MIDNIGHT then £5 after that. If we were fashionable blokes you’d assume launching our new YOU DIG? T-SHIRT today would be clever marketing, jumping on the coat tails of the change on season and the sign of our Autumn Collection – we are not fashionable and yes, it’s pure pot luck! However, they defiantly have landed in the YOU DIG? BANDCAMP should you want to pick one up and make your wardrobe funky. In support on the A LITTLE SOMETHING RADIO CD COMPILATION out now on HERE & NOW RECORDINGS we bring you OFFICIAL A LITTLE SOMETHING RADIO T-SHIRTS. 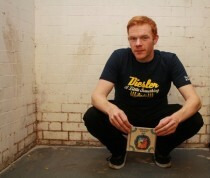 The Navy Blue Tees are available to buy in both MEN & WOMENS size at the HERE & NOW BANDCAMP.